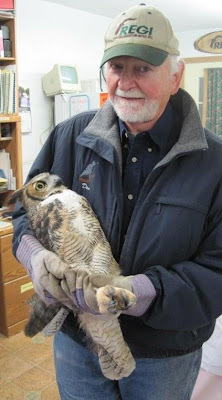 In late April I received a call from Wildlife Rehabilitator Nicki Christianson. Nicki is a friend and State of WI Mammal Wildlife Rehabilitator near Wisconsin Rapids. She has been a tremendous help for years helping us many times with injured birds and often serves as an overnight facility for birds until they can be transported to REGI in Antigo. REGI cares for injured birds from a large area of Wisconsin and the Upper Peninsula of Michigan. As a mostly volunteer organization getting transport for our patients sometimes from several hours away in not always easy. That is especially true during bad weather or at night. Without Nicki, we would not have been able to help many birds from the Wood and Adams County areas. On this stormy evening the call was about a tiny, wet Great-horned Owlet that was on the ground during a storm. The words below are from Nicki as she describes the call she received on the night of the major storm. I got the call a few hours before a bad storm was to hit. I was told that they (The Beans) had seen the little owl earlier in the day on the ground under some tall trees. They thought it best to leave her alone, in hopes mom was still around. But after most of the day had past, the little owl still sat alone. They knew she needed help. That is when I got the call. I went out to check the situation. The little owl looked like a fuzzy melon with huge feet. We searched the entire area, no parents were found. We found two nests one had the bottom falling out the other was empty. We even tried a crow call in hopes a worried parent would show up fearing there youngster was in danger. The storm now on us I called Marge at REGI ask what we should do. She advised I take the little one back to my facility, feed her and put her in an incubator. If the weather broke we would try again to take her back. 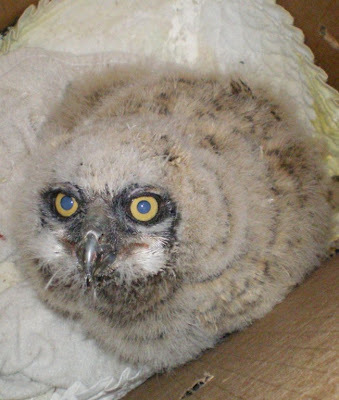 The owlet was very cold, starving and sick...and the weather did not break. The rest of the story is REGI's. CHECK BLOG ON MAY 2, 2009 for the day Bean was admitted to REGI. Summer passed. 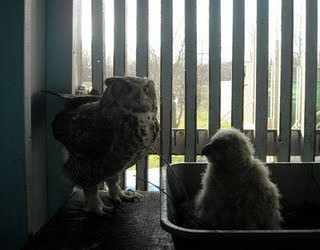 The owlet was raised by two non-releasable Great-horned Owls. The adults are not able to be wild but serve their species by raising orphans every year here at REGI. We don't have much contact with the youngsters during their growing up stages because we want them to be wild and not comfortable with humans. Not much contact means not many photos are taken during the process either. Pretty much the young birds hardly know they are in captivity. Great-horned Owls stay near their youngsters until October when they begin to think about their next family. Like many birds, Great-horned Owls mate for life. About a month before the release Bean went into a large flight area to begin her hunting training. She excelled at rodent control in our flights. The time had come to set her free. 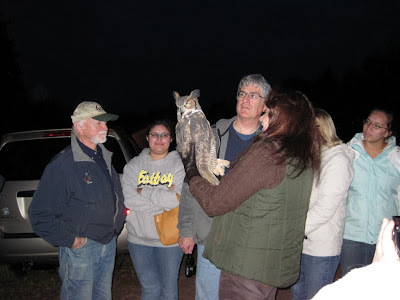 Fred Lane, Wausau business man and friend of REGI had a perfect site for her release. It was his farm in Mosinee. They have horses and therefore lots of mice and rodents hanging about. 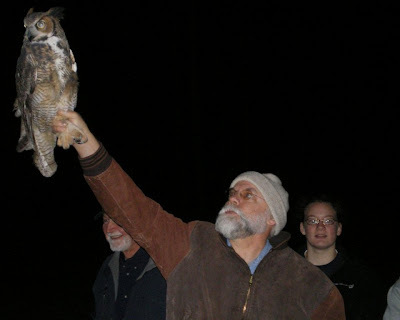 A local Great-horned Owl would be a valuable addition to the area. it was a safe place to release BEAN as they use no rodent poison in the area. We love stories that end on a positive note. Everything went perfectly every step of the way for this young owl to to fly off last night as a wild owl. Bean would not have lived had the Bean family not noted her situation and wanted to help. She would not have survived the first night without Nicki Christianson giving her emergency care on that cold April night. 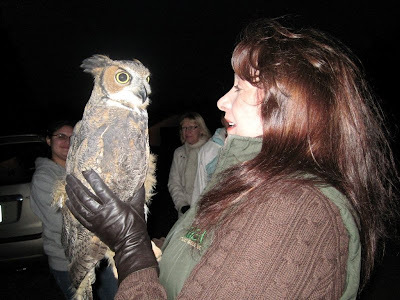 Once at REGI the foster-parent owls raised her to assure she know she was a Great-horned Owl and be able to be released to the wild. REGI staff checked and made sure the owls were getting enough food and enough mice for the owlet. 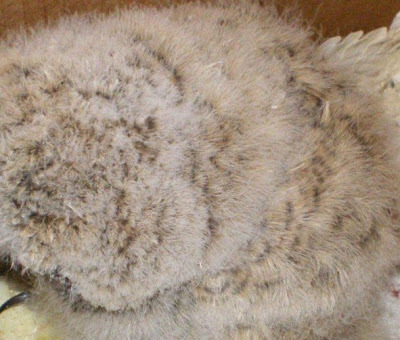 Great-horned Owl chicks can eat up to seventeen mice each night when they are growing the fastest. Bean is a wild owl tonight thanks to so many. I am confident the owl formerly known as Bean, is having a grand time tonight happy to be free of humans and on her own. She is a huge strong Great-horned Owl a with an equally strong personality. We have no concerns about her ability to fend for herself and attract a mate when the time comes.